ROLLING MEADOWS – Alton football coach Eric Dickerson did not attempt to mask the disappointment, but readily conceded the obvious. “It was a great game,” he said. But not the great result the Redbirds had hoped for after earning three leads before a late-rally came up a two-point conversion shy of forcing overtime 290 miles from home Friday night. The unbeaten Rolling Meadows Mustangs survived and ended Alton’s season at 5-5 with a 29-27 victory in a first-round Class 7A playoff game on the artificial turf at Hoese Field. After halting a 10-year playoff drought by making the Class 7A field last season, the Redbirds made it back-to-back in 2018. Graduation took away the biggest leaders and offensive producers from last season’s 6-5 squad that counted on running back Tony Smith and wideouts Kevin Caldwell and Johnathan Bumpers for big plays. Dickerson’s coaching staff and the returning Redbirds embraced the task of sustaining the program build and again met their goal of playing win Week 10. Those were the preseason questions and Dickerson got the right answers to repeat as a playoff qualifier out of the Southwestern Conference. Junior quarterback Andrew Jones passed for more than 2,200 yards with 23 touchdowns – including four Friday night — and 14 interceptions. Sophomore running back Tim Johnson took over Smith’s role as the featured rusher and turned in a 1,000-yard season while averaging better than six yards a carry. Alton will also welcome back three starting offensive linemen in 2019, with juniors Jayme Copeland and Kyle Hughes and sophomore Tristan Underwood all stepping into prominent roles in the front five this season. But it was again seniors that earned their legacy with a playoff trip in 2018. Donovan Porter and Michael Green were back and led the offensive line. And Terry Walker and Ahmad Sanders gave the Redbirds two more playmaking receiving threats on the perimeter. Sanders had 10 catches for 128 yards, including TDs of 11 and the 29-yarder that drew the Redbirds within 29-27 with 24 seconds left in the game. Walker had TDs with brilliant runs after the catch for 16 and 45 yards while finishing with seven receptions for 85 yards. 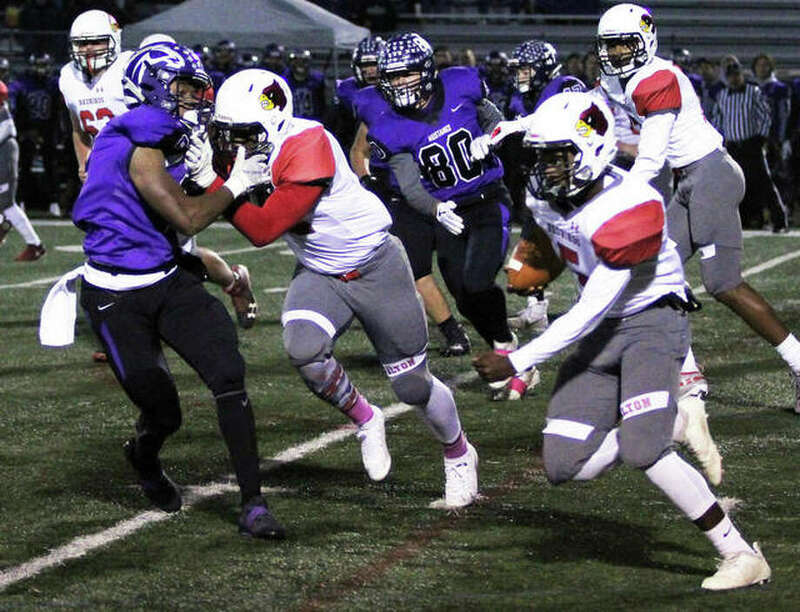 When the Redbirds needed big plays at Rolling Meadows, Walker and Sanders supplied them. “They have all year,” Dickerson said. The heart of Alton’s defense was found at linebacker with seniors Izeal Terrell, Charles Miller and Walker. Miller’s tackle at the 1-yard line on a fourth-and-2 play from the 3 left the Mustangs inches short of a first down and ended a 14-play Rolling Meadows drive in the second quarter with no points. Miller also had an interception in the third quarter he took back 42-yards for TD, though the return was nullified by penalty. Terrell, who will continue his career at Southeast Missouri, kept Redbirds’ hopes alive when he busted through the line and stuffed Mustangs running back Jack O’Hara for a 4-yard loss on a jarring hit on third-and-one and forced a 26-yard field goal with 1:27 left in the fourth quarter instead of a victory-clinching TD. The Mustangs’ TDs came on plays covering 9, 23, 16 and 25 yards and they finished with 356 yards offense. Rolling Meadows came in averaging more than 250 rushing yards per game, but was limited to 163 on 40 carries by the Redbirds. O’Hara, a backup thrust into the starting role, finished with 147 yards on 32 carries. The Redbirds matched the Mustangs with three turnovers. Alton’s Ja’Markus Gary’s interception in the red zone halted a Mustangs second-quarter drive. Rolling Meadows had 95 yards in penalties, including three 15-yarders for late hits on Jones. Alton was flagged for 75 yards in penalties, plus a delay of game that pushed its failed game-tying two-point conversion back to the 8-yard line. “They did some stuff to us with their defense,” Mishler said. “But our kids grinded it out. They made the adjustments we asked them to make. Some times you’ve just got to fight tooth and nail and you’ve got to do you job every play – down, up or in between – and we did that tonight. … It shows you the mettle of our kids.